What does the typical American Catholic look like? Surveys conducted by the Center for Applied Research in the Apostolate tell us she is a 48-year-old, non-Hispanic white, married woman with a Catholic spouse. She is of the post-Vatican II generation (born between 1961 and 1981). Born in 1968, she is probably named Mary, since the fourth most popular girl’s name for that year was Mary, and that name is not a bad choice, given the Catholic cultural odds, over Lisa, Kimberly or Michelle for our Catholic demographic stand-in. CARA has been studying the Catholic Church for more than 50 years. In the last five, we have completed multiple national surveys of self-identified Catholic adults and of pastors. From these we can statistically discern what the “typical” or “average” Catholic experiences in the United States in this second decade of the 21st century. “Mary” has attended college, owns a home and lives in a western state. The annual household income for her family is more than $65,000. She has a teenage son or daughter still living at home, and she works full time. She has another adult child who no longer lives at home. Neither of these children is named Mary (this name fell out of the top 50 in 2002 and has been outside the top 100 since 2009). As a child, Mary did not go to Catholic schools as her parents did, and she did not enroll her children either. While she attended parish-based religious education, her children did not. Currently, she attends Mass at least once a month and always on Ash Wednesday, Easter and Christmas. She keeps up with her parish community by reading the parish bulletin. Her household gives about $10 at the offertory collection. Mary does not use much Catholic media other than the bulletin and is not very active in their parish outside of attending Mass. She will probably never see this article. Her faith is important to her, but there are other things in her life that are equally important. Surveys of pastors tell us Mary likely attends a parish established in the early 1920s that currently has room in the pews for about 450 people. Her parish has about 3,000 parishioners, of whom about 2,500 are registered (including Mary). She attends Mass on a typical Sunday with about 1,000 of them. They have four Masses to choose from—one in Spanish. The parish used to have an elementary school, but this closed five years ago. Any interested students are now sent to a regional Catholic school shared and supported in collaboration with other nearby parishes. Her parish has a resident diocesan priest as pastor and a deacon. Most of the parish leadership is older than Mary—in their 50s, 60s and 70s. About 10 people are on the parish staff, and five of these individuals are in ministry positions. Mary has heard that her diocese may go through a reorganization in the next decade. The bishop is doing his best to balance a difficult staffing equation. Soon the diocese’s parishes will outnumber the total number of active diocesan priests, which will require some parishes to share pastors and staff or to merge. Of course this singular “average” portrait obscures an enormous amount of diversity within Catholicism in the United States. Mary could just as easily be “Maria,” her Hispanic counterpart among the 38 million “mainstream” Catholics who attend Mass at least once a month. Maria is slightly younger than Mary and has more children. She is less likely to be working and is living in a household that on average earns less than Mary’s. Maria is also likely to attend Spanish-language Masses. She is also more likely than Mary to attend Mass weekly. Mary and Maria could be fellow parishioners, as Catholicism has become the most racially, ethnically and linguistically diverse religion in the nation. In some parishes materials need to be translated into five or six languages. Families like Mary’s and Maria’s represent about 45 percent of Catholics. 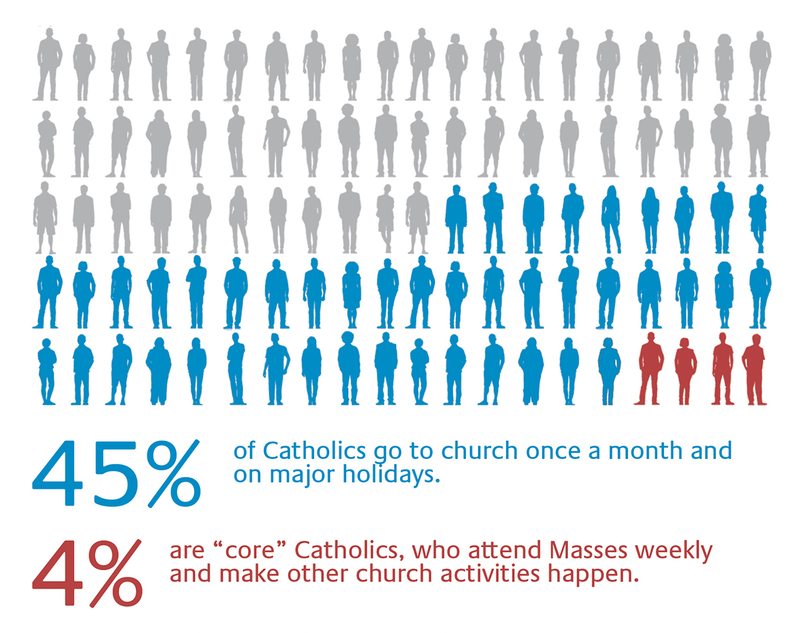 Another 4 percent of Catholics are “the core” of the Catholic community. These are the individuals who do not just attend Mass weekly; they are part of the small community that makes Masses and other activities happen in parishes. They are avid Catholic media consumers and are involved in a variety of devotional practices. They say the rosary and attend to every detail of Lent and Advent. If you are reading this article, you are probably one of them. They are knowledgeable and active in their faith in almost every way. In many ways, they come closest to living the faith life that the church envisions for Catholics. That still leaves the majority of self-identified Catholics out there on the periphery, some 51 percent, with much more distant stories. Among this majority there are distinct sub-groups as well. Some attend Mass at Christmas and Easter only. Some have not attended Mass in years, but nonetheless consider themselves as Catholic as anyone else who has been baptized Catholic. Even further out in the orbit—away from the core Catholics and the mainstream Catholic life of Mary’s and Maria’s families—are the former Catholics. About two-thirds of those raised Catholic in the United States continue to self-identify into adulthood; a third do not. Most leave in their teens and early 20s. Yet even among these former Catholics, something remains. Pew Research Center surveys of former Catholics indicate that about half of those who leave become Protestants. Only 12 percent of the people in the other half are atheists and 16 percent agnostics. Most, 71 percent, no longer have any religious affiliation. The only faith they still likely know is Catholicism. Among this group, 35 percent say religion is still “somewhat” or “very” important in their lives, and 71 percent believe in God. They continue to talk to God; 42 percent say they pray a few times a month or more often. Three-quarters pray with some frequency. In other words, there is still a weak gravity that keeps them within reach of the Catholic Church. The most common reasons cited for leaving the church are that they just gradually drifted away (71 percent), followed by weakened beliefs in their religion’s teachings (59 percent). Some do come back as “reverts.” About one in 10 Catholics today say there was a point in their life when they left for a time. Among those on the outer rings of the periphery who still self-identify as Catholic but who have not attended Mass in years, there is still much about their faith that is alive—just outside the walls of any parish. When praying, they more often speak of a conversation with God, rather than of reciting or discerning something. While they are unlikely to have a home altar, they may have a crucifix hanging above a door or around their neck. They see a donation to storm victims as an important practice of their faith. Grace before family meals at Christmas and Easter is something meaningful to them, not just a tradition. During Lent, they may seek out a fish dinner on Fridays. They follow the pope in the news. They envision a closer relationship with their parish as they age. They chalk up some of the reason for their lack of participation in parish life to their busy schedule, career and family obligations. There will be time for church (and confession) later. They also hope for an afterlife. They have their doubts, but their faith comforts them and they see a place in heaven for themselves. They do not think God will send them to hell for not going to Mass when they are Catholic in so many other ways. The fact remains that the sacramental practice of the Catholic faith is still rooted in the parish—try asking a priest to marry you at the beach. But 21st-century Catholics are a mobile bunch, none more than the millennials (born in 1982 or later), who often foresee a life of many careers and many cities before ever settling down. Why register with a parish if you do not expect to be a member of the community for long? People move, parishes do not. The Catholic Church built an abundance of parishes in the Northeast and Midwest for immigrant communities of the 19th and 20th centuries. In some areas empty walls are all that remain. At CARA we speak of a “Tale of Two Churches.” If you are in the Northeast or Midwest, you probably feel the church is in decline, with parishes closing and fewer people in the pews each year. If you reside in the South or West, there always seem to be new parishioners around you. There are differences as well among rural, suburban and urban parishes. It is in the suburbs of the South and West where Catholicism likely seems most alive or even growing too fast, where finding parking spaces is becoming an issue. In rural parishes, Catholics probably do not expect to find a priest in the parish outside of Mass. In urban areas there are far too many spaces in the pews to choose from. In the South and West, there are hundreds of vacant lots that could be the new parishes of the 21st century. Yet it is questionable if they will ever be built. The church is a feudal institution. Bishops are responsible for their diocese, and pastors for their parish. Not many bishops have spare priests to share with dioceses in need that are looking to build new parishes. What remains is a mismatch between the Catholic population and its real-world institutions. Regardless of where one lives, every Catholic finds something, at least one thing, that they love about their faith, or they will probably leave it. For some it is a social justice issue; for others it is about protecting life; for others it is providing service and ministry. They all also to some degree find things they disagree with the church about. Just look at life issues, and it soon becomes evident that less than 10 percent of Catholics would fill out a “ballot” in agreement with Catholic teaching and give answers entirely consistent with the church. There are few truly “good Catholics” by absolute doctrinal standards. By a more pastoral standard, there is an abundance. Apart from attending Mass, Catholics are most likely to say helping the poor and needy is most important to their sense of what it means to be Catholic. Some of what appears to be disagreement may also reflect misunderstanding. Fewer than two-thirds of Catholics, for example, believe that the bread and wine used for Communion really become the body and blood of Jesus Christ. How can so many disagree with this central teaching of the faith? Surprisingly, it is because many are unaware that this is what the church teaches! Only 46 percent of Catholics are aware of what the church teaches about the real presence and agree with that teaching. An additional 17 percent agree, but do not know this is what the church teaches. A third do not agree with the teaching but are unaware of the teaching. Finally, only 4 percent of Catholics know what the church teaches about the real presence and do not believe it. Indeed, one of the most challenging problems for the church is religious education. The number of children and teens enrolled in parish-based religious education in U.S. parishes declined by 24 percent since 2000. A majority of members of the pre-Vatican II generation (born before 1943) and the Vatican II generation (born between 1943 and 1960) attended a Catholic primary school (51 percent). But only 37 percent of post-Vatican II generation (born 1961 to 1981) and 23 percent of millennial generation (born in 1982 or later) Catholics did the same when they were growing up. Currently, fewer than one in 10 Catholic parents has a child enrolled in a Catholic school and about one in five has a child in parish-based religious education. Most Catholic young people today are receiving no formal religious education. The as yet unnamed generation following the millennials (born 2004 and later?) may be the “Wikipedia generation”—informed about their faith mostly from online resources unrelated to the church and used when needed. So perhaps we can expect more confusion about the real presence among Mary’s and Maria’s children. In any case, there will certainly be more children and more Catholics. That is the surprise ending to this story. CARA expects the Catholic population of the United States will approach 95 million by 2050. Despite the falling retention rates, natural increase (more births than deaths), the reverts and immigration will keep the Catholic population growing while many other Christian traditions see their numbers fall in the decades ahead. One cannot predict the outcomes of papal conclaves or what will happen at the conclusion of the Synod of Bishops on the Family this fall. But it is certain that the pope of 2050 will preside over a significantly larger Catholic population in the United States than exists now. Mark - thank you for this fascinating and very revealing article, packed with interesting statistical information, some of it sad but still hopeful (coming home with age). I have seen the figures about self-identified Catholics (SICs) and the Real Presence previously, but I did not know that only 4% know the teaching and yet repudiate it (several likely with a PhD in theology, unfortunately). It does help to explain some of the very odd results from national opinion polls and the weakness of using the SIC definition (probably 1 or 2 questions in a poll) for recording what "Catholics" believe about any particular issue. It is also a challenge to the idea of sensus fidelium, as it would seem most SICs are outside any reasonable definition of the term (of course, the latter term, according to VCII, requires assent to the Magisterium and a certain unanimity). Lots of work for the Coming Home Network to do. This article also appeared in print, under the headline "Your Average American Catholic," in the May 18, 2015 issue. Mark M. Gray is a senior research associate at the Center for Applied Research in the Apostolate at Georgetown University and the director of CARA Catholic Polls.